Welcome to the Internet home of the Iron Scouts, a progressive War Between the States enacting group. 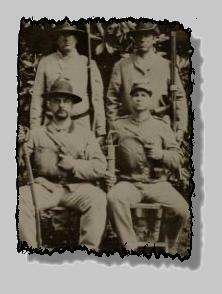 The original Iron Scouts were a select group of troopers from the four companies of Colonel Wade Hampton's Battalion of Cavalry and later included members from the SC 1st and 2nd Regiments of Cavalry, the NC 1st Regiment of Cavalry, and the Prince William Cavalry (VA). Continuing in this tradition, the modern "Scouts" recruit outside of geographic boundaries and the unit boasts members from North and South Carolina as well as affiliations with individuals and units from Georgia, Virginia, and Tennessee. To learn more about us and what we do, visit our Mission page or try to visit us in camp by attending an event listed in our Event Schedule. You can also Contact Us for more information. You will find us always willing to talk, teach, and learn more about our hobby and we value your Feedback on this site too! We have developed a mounted impression for American's "first Civil War," the American Revolution. We portray Colonel James McCall's (South Carolina) State Troops and the 3rd Continental Light Dragoons (as well as Tories as necessary). Click here to visit our "alter-impression" web site and see what information we have gathered on these important Patriots.